If you start a fire you are responsible for managing it, keeping it under control and extinguishing it. Is it appropriate to light a fire here and now? Are you going to be in the woods long enough to warrant one? Is it too hot and dry for it to be safe to light a fire? 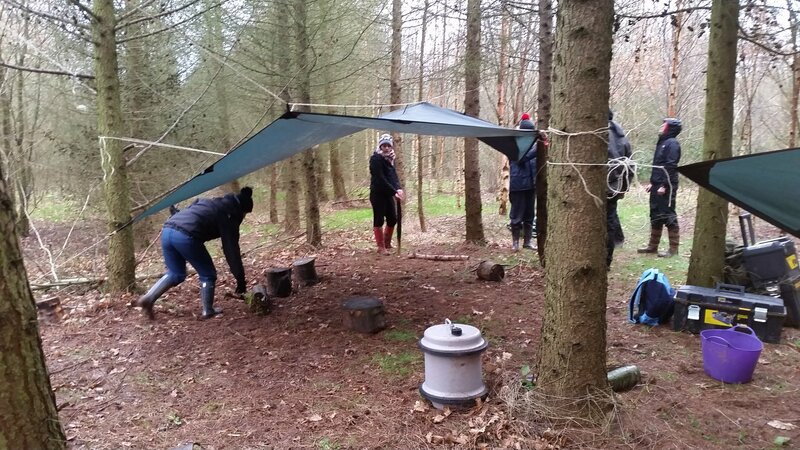 Do you have enough staff with you to manage a camp fire and supervise the children? The site for the fire should be away from tarps, tents and any buildings or other structures. Check for holes of lumps in the ground that may present a trip hazard. It may be possible to fill small holes. If winds are high consider wind direction when choosing the site for the fire. Clear and area, at least 10 foot around the fire, of twigs and sticks. Brush any leaf litter and other debris away so the area is down to bare soil. Mark a boundary, of suitable size, around the fire pit area with logs or sticks. Make sure there is plenty of room for movement around the fire. Mark a clearly defined entrance and exit to the area. An emergency exit on the opposite side to the main exit may also be useful. People should only enter through the entrance and exit through the exit. 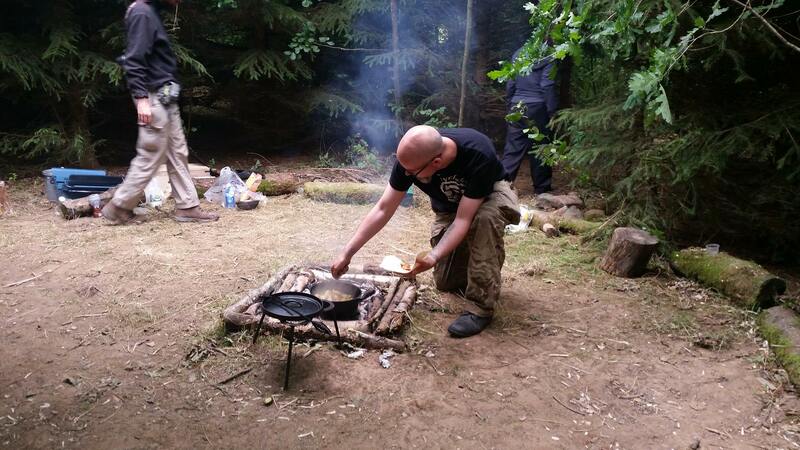 One way movement around the fire pit area will reduce the chance of people bumping into each other and ensure that those managing the fire know which way to expect people to approach. Everyone should use the entrance and exit and no one should step over the boundary. 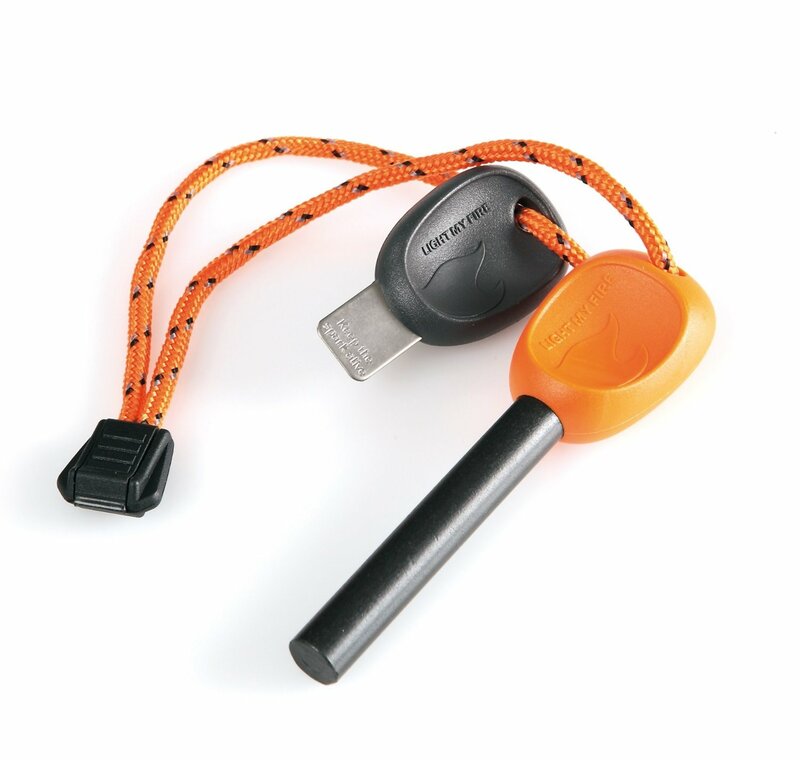 Not only does this ensure those in the fire pit area know where people are coming from it also significantly reduces the chances of someone tripping up near the fire. Water drum sited near the area being cleared for a fire pit. There should be water nearby to extinguish the fire. If there is no natural source of water you will need to take with you ample water to ensure that after any water used for cooking and drinking there is more than enough to leave the fire area safe. If water is not available it is possible to extinguish the fire with dirt but care needs to be taken not to bury the fire and leave it smouldering with a risk of reigniting after you have left. You may also want to take a shovel with you to clear the fire. The camp fire should never be left unattended. Before preparing and lighting a fire ensure you have enough staff if someone is going to be responsible for managing the fire. The diagram above is called the fire-triangle. It shows each of the elements a fire needs. To burn effectively the fire will need to be managed to ensure the right combination of these elements. 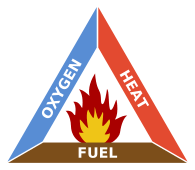 To stop combustion of a fire one of the three elements of the fire-triangle has to be removed. Before you light the fire collect plenty of tinder and kindling. Shavings or scrapings of birch bark conifer resin and dry pine needles all make good tinder. King Alfreds’ Cake is a fungus that grows on dead Ash and also makes good tinder. If you do not know the woodlands it is worth taking tinder in with you. For fuel you will need to collect wood of increasing diameter and slowly increase the size of the fuel you add to build your fire to the desired size. If the ground is dry then wood can be collected directly from the woodland floor. If the woodland floor is wet or damp then any wood on the floor will also be and you will best to collect standing dead wood or branches that have fallen but landed in bushes or lower in the tree. Good firewood can be easily recognised as it will snap not bend. The fire should be built on a rock base or on bare soil. You may need to dig down slightly to ensure no wood, moss or twigs are in the fire pit. Build the fire as small as a possible. Building a larger fire than you need will just make it harder to control, take longer to burn down and waste fire wood. Be careful to feed the fire with fuel and not smother it. Putting too much fuel on the fire at once will restrict air flow, extinguish flame and cause it to smoke excessively. Double walled fire boundary and welding gauntlet. A welding gauntlet or other heat proof glove will make managing the fire, and cooking, easier. Rocks or logs around the fire pit create a boundary to contain the fire and prevent children from getting too close to the fire. In the picture above a double wall of logs has been used to create a boundary. Using the logs in this way also creates a shelf for pans and other items to keep them off the ground. Children should be taught to kneel in front of the fire on one knee only. This way they will be more stable and having a foot on the ground will mean they are able to move quickly if something unexpected happens with the fire. Consideration should be given to the types of wood available. The tables below list some common woods and the properties that make them good and bad for use on a fire. There is also an old poem about wood burning which can be used to help children remember the types of wood to use and avoid. Sycamore Burns with a good flame and moderate heat. The thinner branches of this tree make good kindling. Cedar Good firewood if well seasoned, giving little flame but plenty of sustained heat. This makes it a good option for a cooking fire. A cedar fire also has a pleasant smell. Thinner logs and branches will burn when green. Hornbeam Good firewood that produces a hot, slow burning fire. Apple Burns slowly and steadily with good heat but little flame, and doesn’t tend to spark or spit. Like all fruit woods, it has a pleasant smell and adding a few pieces to a cooking fire gives an excellent flavour to smoked foods. Cherry Burns slowly with good heat and a pleasant scent. Pear Another fruit wood that provides good heat and gives off a pleasant scent. Hazel A good all-rounder but burns quickly. Smaller pieces make good kindling. Douglas fir Well seasoned Douglas fir will burn slowly and produce good heat, but in general it is unsuitable for a campfire as it gives little flame and has a tendency to produce sparks. Larch If well seasoned it gives good heat but is liable to crackle and spit excessively. Spruce Burns quickly and produces many sparks. Horse Chestnut Good flame and heating power but considered poor firewood as it spits a lot. Sweet Chestnut Burns when seasoned but spits continuously and excessively, making it generally unsuitable for camp fires. Alder Burns quickly and produces little heat. Poplar Burns very slowly and produces little heat. It makes poor firewood. 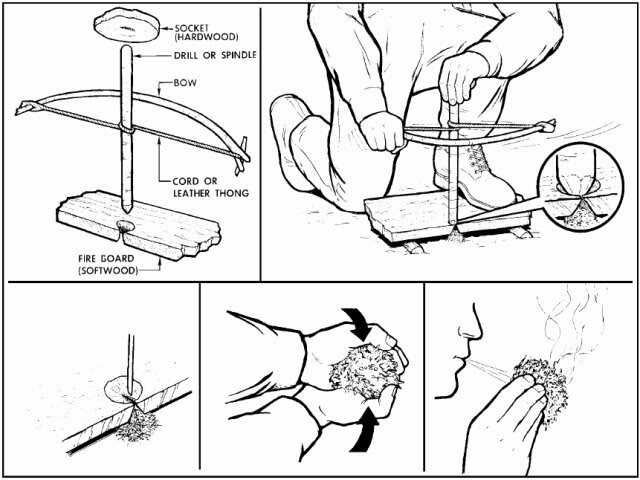 There are a number of ways to light a camp fire. Matches or cigarette lighter are the quickest and most convenient methods. 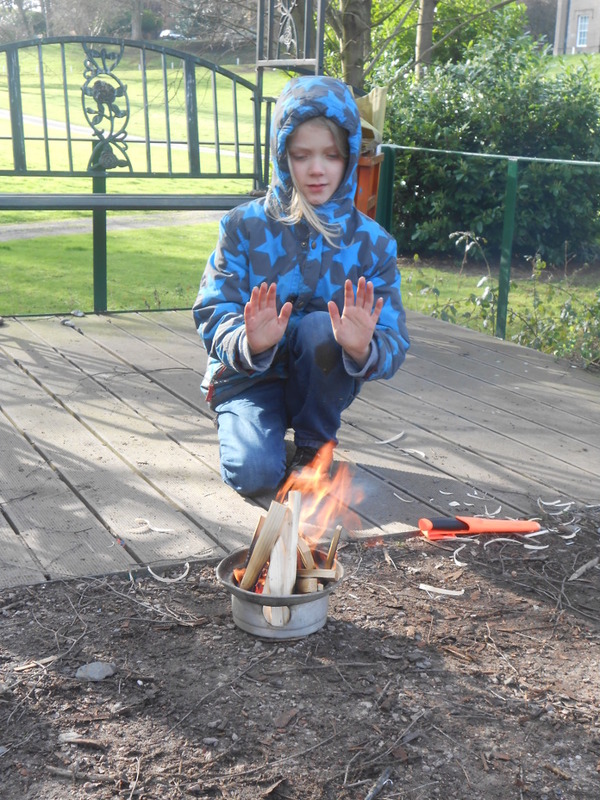 Fire steels are fun to use and it is reasonably easy for children to learn to use them. Striking the steel in a downward motion against the fire stick creates hot sparks. Practising using cotton wool, which ignites with the smallest spark, as tinder will give children a chance to master the technique before trying to light natural tinder such as birch bark. 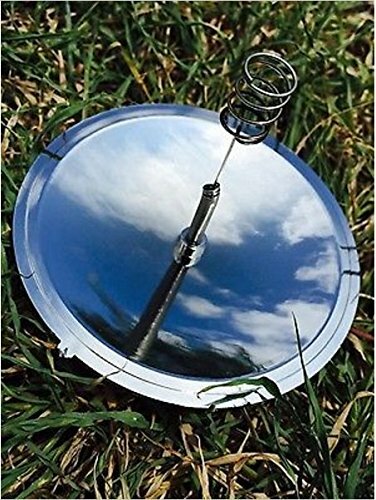 Other fire lighting tools can be used such as magnifying glasses and parabolic reflectors which use the heat of the sun or fire pistons which, like a diesel engine, use compression to light the tinder. Cotton wool is a cheap, effective and accessible tinder. Char cloth is another effective tinder that is simple to make. Small pieces of cotton or linen fabric are placed in a tin. 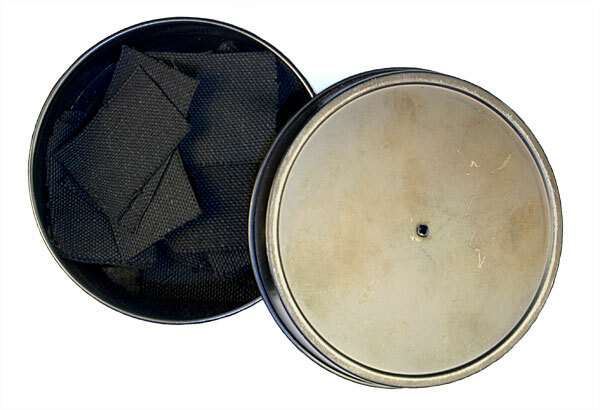 A small hole is punched in the lid of the tin and the tin is heated on a fire. This causes the cotton to burn very slowly and produces fragile black char cloth. Char cloth will take a spark reasonably easily and allow you to transfer it to a larger bundle of tinder. 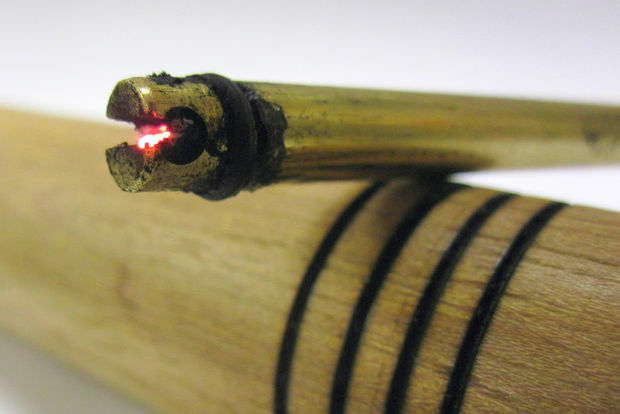 Other fire lighting methods which are trickier to learn include a flint and steel or bow drill. 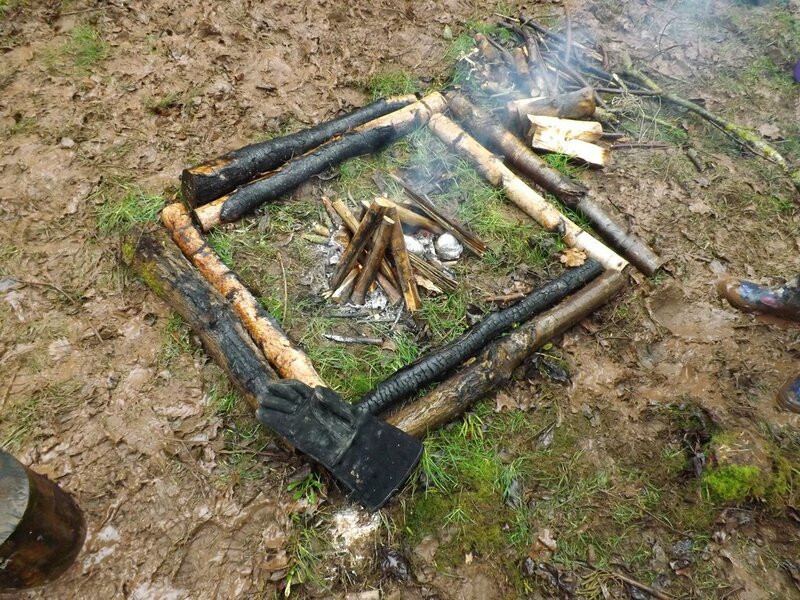 There are numerous ways to lay a camp fire. The diagram and descriptions below show four common lays. To make this fire arrange the tinder and a few sticks of kindling in the shape of a tepee or cone. Light the center. As the tepee burns, the outside logs will fall inward, feeding the fire. This type of fire burns well even with wet wood. To lay this fire push a green stick into the ground at a 30-degree angle. Point the end of the stick in the direction of the wind. Place some tinder deep under this lean-to stick. Lean pieces of kindling against the lean-to stick. Light the tinder. As the kindling catches fire from the tinder, add more kindling. To use this method scratch a cross about 30 centimetres in size in the ground. Dig the cross 7.5 centimetres deep. Put a large wad of tinder in the middle of the cross. Build a kindling pyramid above the tinder. The shallow ditch allows air to sweep under the tinder to provide a draft. To lay this fire place two small logs or branches parallel on the ground. Place a solid layer of small logs across the parallel logs. Add three or four more layers of logs or branches, each layer smaller than and at a right angle to the layer below it. Make a starter fire on top of the pyramid. As the starter fire burns, it will ignite the logs below it. Love this document. Great information. Really like the section on good and poor wood to use for a camp fire.